...my oh my what a bluebird on my shoulder kind of day - for a hardly chilly but indisputably hilly ride on Vashon Island. 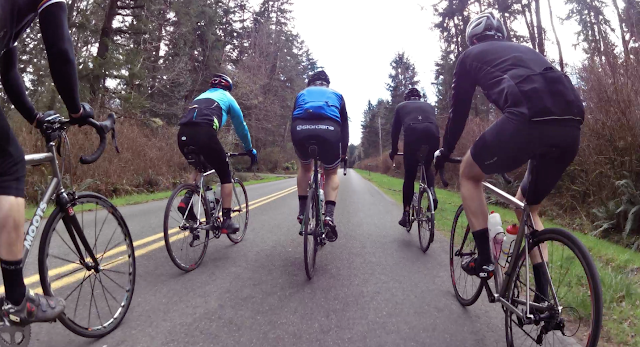 This year the turnout of riders - representing a wide range of fitness levels - all opted to ride the same route ("Beveridge Place to Fauntleroy Dock" plus "Vashon Standard Loop"), in one group. Two riders opted to start/finish their Willy Nilly from northeast Seattle. The weather was conducive to lots of stopping to smell the flowers (figuratively and literally...cherry and dogwood blossoms were exploding in some areas...in Feb??). Out on the roads of Vashon we crossed paths with several other groups of cyclists who had a similar idea of getting out on the "same day, different island" for a peaceful and soul-nourishing spin. One of them was pedaling a recumbent. I ardently wished that person - who was clearly riding his ride - was part of our Willy Nilly crew. A perfect candidate for the open position of Willy Nilly mascot. Per usual we paused at the Burton Coffee Stand for a quick jolt of delish coffee...the pause turned into an ad-hoc lounge session in the patio area, where we were greeted by some feisty tulips getting an early start in the surrounding flower beds. From Burton we rode north on Vashon Highway, then swung east onto SW Quartermaster Dr. and worked our way over to one last notable climb up SW 204th St and Ridge Rd SW before our next stop at the Snapdragon Bakery & Cafe. The always-friendly locals running the Snapdragon offered us an array of exquisite baked goods, which stunned some of us into indecision. Eventually we all partook in the incomparable mid-ride pairing of a Snapdragon baked treat with a pint of Lucille IPA. More lounging ensued before our last short sugar/beer-fueled burst of energy carried us to the Vashon ferry dock. Last stop, per usual: West Seattle's Beveridge Place Pub, where our final stage of rehydration was accomplished...each of us found and quaffed a particular malty beverage that suited our individual needs. "Ride your ride" can evidently be applied to any aspect of this day.